Websticker is a division of Freely Creative, Inc. a marketing company specializing in the design and production of custom printed outdoor stickers, die cut stickers, transfer decals, custom roll labels and promotional magnets. We have been based in Stowe, Vermont since 1991 and have been online since 1996. We take great pride in our reputation as a custom sticker company that goes above and beyond to create value for our customers and produce the most powerful and effective stickers possible. Unlike many sticker manufacturers, we guarantee all of our work 100%. There are several reasons our sticker development and manufacturing stands out from other sticker suppliers and we are your best choice for sticker production. 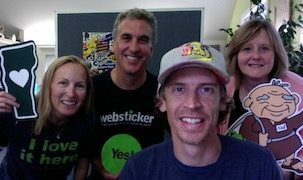 Websticker was a solid, profitable sticker manufacturing company before we had an online presence. We’ve been doing this (and doing it well) for over 25 years with exceptional relationships with the best manufacturers in the U.S. and a dedicated staff and systems in place to personally take care of any of your promotional sticker needs. Many sticker, decal and label companies are also distributors of thousands of promotional products with little or no discounts from published catalog rates. As a custom sticker marketing company, we have laser-like focus on stickers, decals, labels and promotional products that stick. As a sticker manufacturer and marketing agency, we are experts in this field. We do not want to simply sell you a product with your logo or message on it - we want to do the creative and design work necessary to produce the most effective, powerful and economical stickers possible. Many of the new online sticker manufacturers have limited sticker production methods at their disposal. They, of course, want to print every sticker using their available technology and materials. This can be very limiting and may result in not getting the best possible material, print method or price for your specific needs. Our partnerships with the biggest and best production facilities in the U.S. allow us hundreds of options for printing the sticky promotional products you need. As a custom sticker company, we prefer to use the highest quality materials and inks available, but the bottom line is working with you to get the best value on design and sticker production for your particular uses. We believe that in order to be the best custom sticker company we can be, it is essential to work with each customer individually on product options, designs, layouts, and ordering. That is not to say that our design and production takes any longer than other sticker manufacturers, just that you’ll be working directly with real people who care and take responsibility for getting you exactly what you need.